This is a great crossword puzzle for right before the holidays. 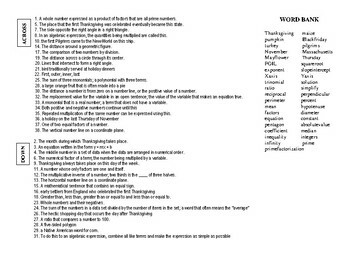 Contains a combination of Algebra and Thanksgiving related terms, and is designed to fit on the front and back of one sheet of copy paper. For the clues, I've included two versions: one with a word bank and one without. 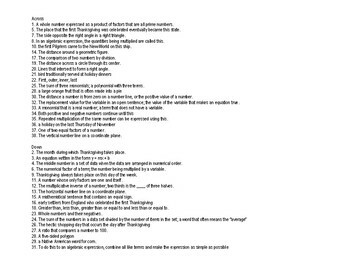 Have used this for a few years now, and I find it works just right with a 45 - 50 minute class period for students at the Algebra I level who really don't have their minds on anything except the upcoming Thanksgiving break. 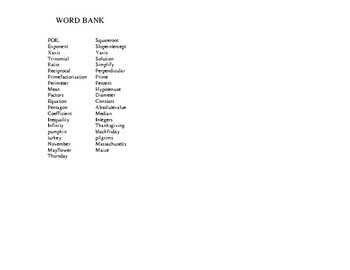 Includes word bank page and solutions. Hope you enjoy this, my first TPT product. I'm working on much more to come.